So you designed a part and are ready to turn your design into reality via CNC Machining. 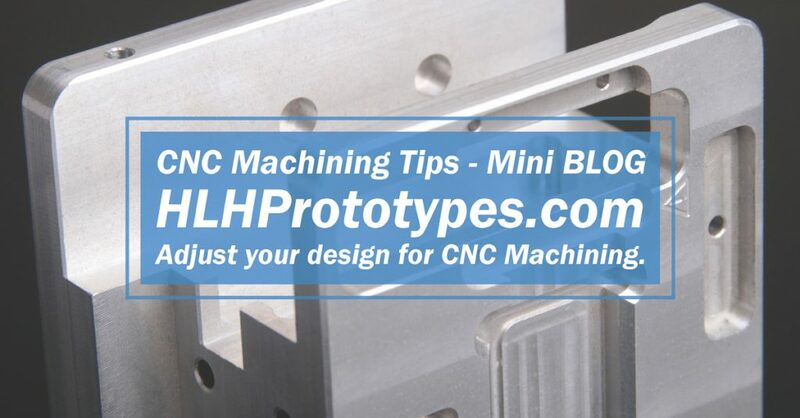 Whether you are looking for a single rapid prototype or a low-volume production run, here are a couple of CNC tips to review against your design before you submit for quote. If you can save your manufacturer machining time then you will get a better price. Thin Walls – For metals 0.8 mm minimum thickness is recommended while 0.5 mm is possible. For plastics 1.5 mm is recommended while 1.0 mm is possible. Thinner walls increase vibration during machining making achieving the tolerance of the thinner walls more difficult. Thicker walls are recommended for plastics when your design allows to help reduce the risk of warping. Threads – External threads are cut with dies, while internal threads are cut with taps. Minimum thread size is M2 while it is recommended to use M6 or larger if you design will allow. CNC threaded tools limit the risk of breakage and can be used to cut down to M6. M6 and up will help your price. Small Features & Holes – Holes and cavities down to 2.5mm in diameter are pretty standard across machine shop capabilities. Below this diameter is referred to as micro-machining and will increase your cost. Avoid features smaller than this when possible to help your part price.